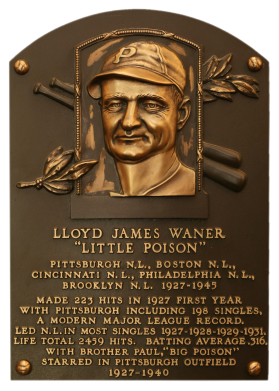 "Little Poison," to older brother Paul's "Big Poison," Lloyd Waner was to the single what Babe Ruth was to the home run. 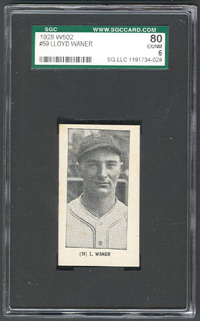 In 1927, Waner's rookie year, the little leadoff man hit 198 one-baggers. 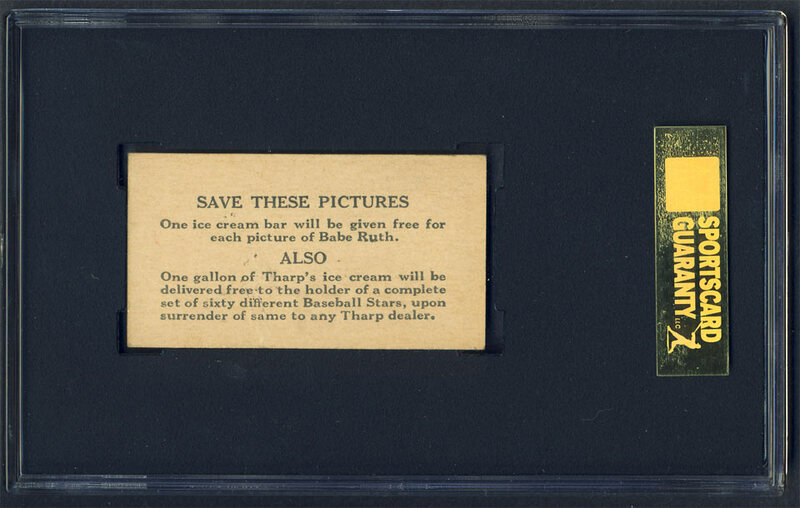 He used his speed to cove the vast Forbes Field outfield, leading the NL in putouts four times. 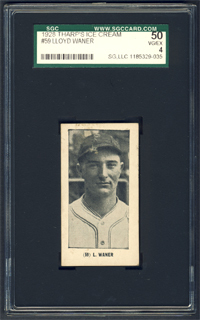 Waner had a .316 career batting average, 2,459 hits, and 1,201 runs scored. 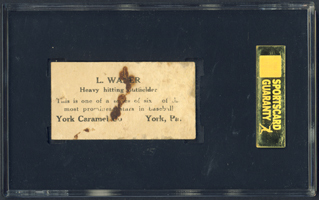 Description: Issued in 1927, this 63-card set is closely related to the York Caramel set (E210) of the same year. 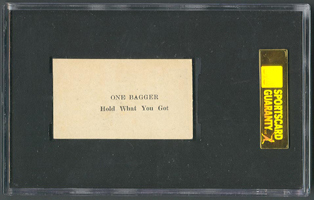 The black-and-white cards measure 1-3/8" X 2-1/2" and display the player's nameat the bottom in capital letters preceded by a number in parentheses. The backs of the card read either "One Bagger," "Three Bagger" or "Home Run", and were apparently designed to be used as part of a baseball game. Comments: In November, 2002 I won an eBay auction for a PSA 7 1939 Playball card. 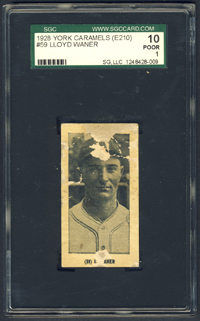 I upgraded to a beautiful PSA 8 in August, 2003 with another eBay win from seller and hobby friend Brian Hodes. 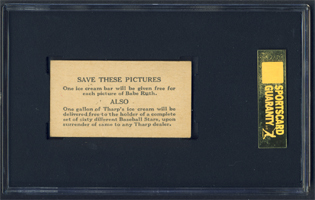 In November, 2006 I decided to swap the Playball out for a new type card and won the 1928 W502 SGC 80 card from seller David Barkus (barkusd) on eBay. I have since also purchased the E210 York Caramels SGC 10 in September, 2010 and Tharps SGC 50 in April, 2011 off eBay. At this point I'm not sure what my next move will be. I'd be comfortable selling 2/3 cards but want the issues somehow represented in the collection (Joe Judge, fan favorite is a possibility for one).